Oh how I adored this book. Seriously. Full of Adorkable awesomeness that had me laughing and reminiscing like crazy. I am a nerd. Plain and simple. I have no shame. .... now. - middle school is another story, I hid my nerdiness in a deep dark cave of shame unless I was with my family doing Harry Potter quizzes. - I'm not just a book nerd. Oh no, that's been out for awhile now. I can obsess over movies and TV shows with the best of em. The Buffy The Vampire Slayer Musical episode? I can sing it all loud and proud! But this book is about more than being a nerd, it's about being scared to let your nerd flag fly. The Summer I became a nerd is a Contemporary YA that I can totally get behind recommending to my Teen friends. So many Contemporary YA's focus on high school drama and crushes and I just can't get behind them :/ But this one.. This one is so much more. Maybe your not a nerd. That doesn't mean you won't still appreciate this book. Maybe you won't get the " Who would win in a dual between Voldemort and Vader? " Reference ( Voldemort obviously ) But It shows the other side of the card too. It shows Maddie simply trying to fit in in high school. Fighting with her inner self over what she feels she should do, and what she wants to do. Yes there is a romance. But it's a perfect geeky one! Logan helps Maddie come out of her shell the way non of her other friends can. He shows her how it doesn't matter if everyone doesn't get your passion, as long as you admit that it's your passion! My favorite scenes were probably the LARPing ones :) ( Live Action Role Play ) Not because I do that. Ya, I was in theater, but I haven't gotten into LARPing yet. My boyfriend on the other hand get's mighty close. He doesn't do live action, but every now and them him and some of our friends will hide away in a deep dark cave of a room, pull out their notepads, and explore unknown worlds as different people. I never got it. I laughed I admit. I couldn't follow how it all worked and got confused when he tried to explain. But The Summer I Became a Nerd explained it from a different viewpoint that I was able to understand. Now it just sounds fun! I still don't think I will do it. But I understand the appeal more. Basically. The Summer I became a Nerd is pure nerdy geekdom awesomeness. It has so many fun and witty references - some I got- some I went and looked up. It reminds me why I love being a nerd and am now unafraid to share my passion. It reminds me that not everyone is comfortable with who they are, sometimes they are fighting an inner battle that we just can't understand. 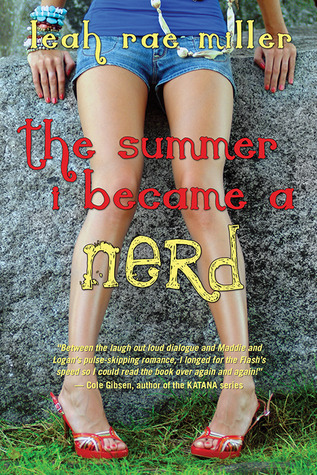 The Summer I became a nerd is more than just a wonderful comedy, it's a contemporary story about accepting who you are and realizing that other people don't have to like it, as long as you do. I absolutely adored this book, too.